This is another recipe that I have been cooking for years, yet have not gotten around to putting on the website because of how difficult it can be to find raw chorizo mince. When you do find it, you definitely don’t want to look at the ingredients list! A big thank you to Brooke for giving me the idea of teaching people how to make their own healthy chorizo mince. Finally made these tonight and I always follow the recipe as is to start off with. Next time I will add extra chilli and a cube of mozzarella to the meatballs to take them to the next level. Thanks for yet another amazing recipe. This was fantastic and will be a regular. I love the smokiness and the sauce was to die for. Served with pasta and topped with cheese. I want to eat this everyday..
May have just caught my husband slurping the left over sauce out of his bowl… I think we can say he definitely approved of this dinner!! Super tasty and speedy to cook. Thank you. Oh my gee the flavour !!!!! Another winner, whole family loved. Super easy. I made this yesterday and for some reason it was really salty, even though there is no salt added in???? I only used the recommended amount of stock concentrate as that was my first thought? I obviously made an error somewhere but buggered if I know where. I served with spaghetti. I may try it again , just to work out what went wrong, maybe with chicken. I’m attempting this recipe today and was a bit confused how to cook the meatballs, as it just says insert simmering basket so assume you cook them in there, but there are so many of them do you just layer them on top of each other? Also one of the tips in the book is to add some cream to the bowl afterwards, what do you then do with that? Add it to the regular sauce, or use it for something else? Super easy and tasty. A bit spicy for my toddler but I found it to be the perfect amount of spice. Served it with pastas as spaghetti and meatballs. This was sooooo yummy!!!! Super quick to make. I’m not usually a fan of meatballs but these were amazing. I will be making these on a regular basis. These were an absolute hit at our house! Will be making mini chorizo meatballs to freeze and add to dishes we would normally buy chorizo for. Made these with Pork and Veal mix as that was what Aldi sold. Whole family devoured them and my kids were asking for seconds (sadly there were none). I served with the creamy Cauliflower mash. My husband commented all night how wonderful dinner was. Definitely a winner in this household. Couldn’t believe that it only took 30 minutes to make from start to finish!! Delicious, quick and easy family meal. Everyone loved it, and that chorizo mix? You’re a genius Nik. One THMII recipe down and I can’t wait to try the next one already. Thank you!! Very tasty! I didnt think they would be as nice as they were steamed (not fried) but they were delicious. I liked the flavour better the next day, perfect for freezing for busy nights. Best meatballs I have made in my thermi to date! So yum! Served with sweet potato mash and broccolini. Thanks Nik!! Yummy easy recipe! Toddler approved. So delicious. I’m generally not a huge meatball or pasta sauce fan by loved this. So much flavor. Prepared the mince a couple of days in advance and husband was able to do the rest while I was out. So flavoursome. I served mine with pasta and Skinnymixers wraps to mop up the sauce. Love love love this sauce!!! I served this with a cauliflower mash, and it was a delicious, warming meal. Thanks Nik! has anyone tried this with bellini and what times did you use for cooking he meatballs? I was skeptical about two things making this recipe, 1- would it actually taste like Chorizo, and 2- would it be cooked after 20 minutes. Thank you SO MUCH, I love this recipe. Are we really supposed to leave the mc off for both cooking steps? I can’t see how the balls will cook like this??? 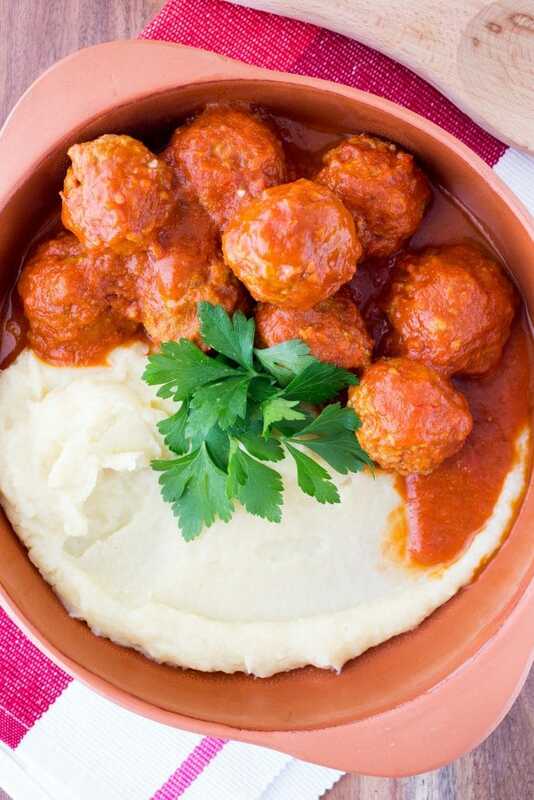 To freeze for quick weeknight meals, is it best to freeze before or after cooking of meatballs? Wow! Such an amazing meal, it’s so quick and easy that I managed to make 2 batches in such a small timeframe, it’s so easy to prepare to cook later too! Amazing. Whole family loved it. we had it with pasta and i had sweet potato mash. Made this tonight and my “not a fan of paprika” husband loved them. Thank you. I have a Tefal Cuisine Companion and made this tonight with cauliflower mash. It was AMAZING!! Tip: use ultrablade to mix all meatball ingredients together and then cook meatballs in with sauce (not in steamer basket), mixer blade, speed 3, 120 degrees, 20 minutes. After first 10 minutes I was concerned it wouldn’t cook through (I had nearly 600g pork). But 2nd 10 minutes fully cooked. Served with zoodles and broccoli steamed in Varoma for last 10 minutes. Everyone loved these! Very tasty, thank you! A new favourite tk be added to weekly meal plan rotation! Super easy and full of flavour. I am new to thermomix and skinny mixers. I have just bought the Thm and Thm11. 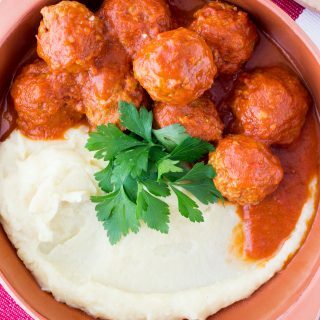 Ib this recipe (chorizo meatballs) what stock paste should I use? I used chicken stock because it was all I had. Worked well. Yum. Home sick today. Just had for a light lunch with green salad. Will be on repeat list. I used Beef stock powder as haven’t made my own stock paste yet. Tastes great.